Our swing top can has a perfectly balanced swing lid that opens easily and then gently swings back into place. The sturdy stainless steel construction, lift-off lid, and large capacity make it an ideal choice for commercial spaces such as restaurants and coffee shops, or even busy families. ADA-compliant. Our code P liner fits this can perfectly — no bunching or slipping for a cleaner trash experience. Center-weighted swing lid opens easily and then gently swings back into place. Large capacity and swing lid make this an ideal choice for small businesses such as restaurants and coffee shops, or even busy households. Lid lifts off easily for a quick bag change. Non-skid base has rubber pads that are gentle on floors and keep the can steady. Durable inner bucket catches messy drips and lifts out for easy cleaning. If your bucket gets messy over time, freshen up your can with an inexpensive replacement bucket. We use the best materials and solid engineering so our products will last for years. Our code P liners are designed to fit this can perfectly so they don't slip, and they stay completely hidden. Extra-thick plastic and double-seam construction prevent rips and tears. In a new home with no room for my usual under-cabinet garbage can, and with a large, hungry dog. This can has been great -- simple, beautiful design that slips into the kitchen decor with no effort, tall enough, and tricky enough that the dog cannot sample the garbage hidden inside. 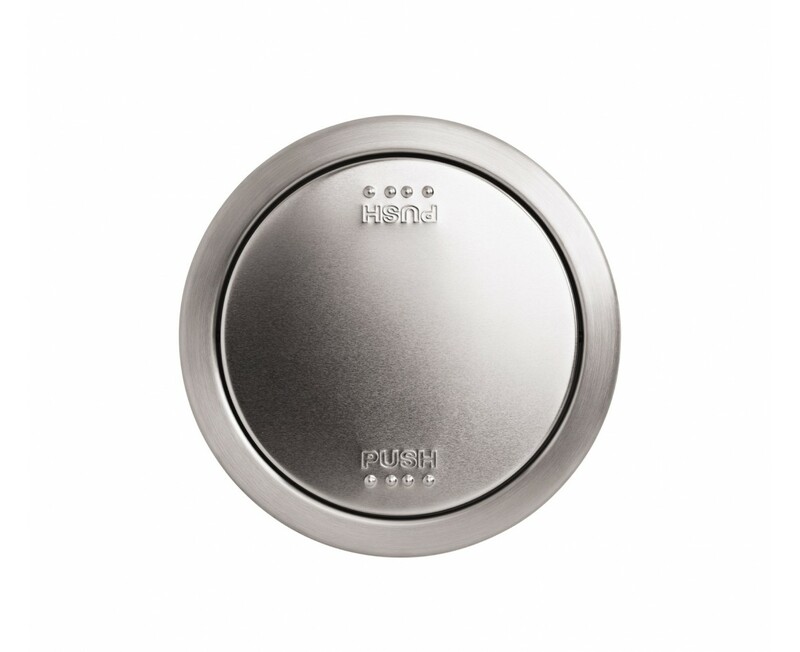 The lid is perfectly balanced and operates silently and efficiently. The only drawback are the inevitable finger prints on the stainless steel. But with a simple wipe of cleaner, and their gone. I had my old beautiful trash can for 10 yrs. and loved it. Somehow in my move, it did not get here with my other stuff. I looked through a storage unit I rented to no avail and finally gave up and ordered my beautiful new one. Why did I wait so long? With a dog that loves garbage and a very busy kitchen w/ flour flying and B A recipes being tried! This cannister lines up w/ counter so it is great w/ easy cleanup!! It's handsome, well designed and well made, fits under the kitchen counter, big but not huge...an ace of a product. I wish more consumer products were this well thought out. I AM VERY PLEASED WITH THIS PRODUCT. IT IS STURDY, OPULENT IN APPEARANCE, AND I HAVE NO COMPLAINTS. IT IS ALWAYS DIFFICULT FOR ME TO ACCURATELY ASCERTAIN SIZE FROM PHOTOS. THIS IS A LARGE CONTAINER, AS MOST PEOPLE WOULD LIKELY REALIZE FROM THE STATED 55 LITRE MEASUREMENT. I bought this can for my daughter in law. She absolutely loves it. She likes to keep her trash hidden and had bought other cans that have the step to press to open the top and they have always broken. This is the one for her and she has used it for several weeks now and also loves the capacity. I personally own the open top half round and I love it, too. This is our second Simple Human garbage can for our home. We purchased the first one at Bed Bath and Beyond, and we knew the quality and how pleased we were with it. I could not find this design in a store so I had to order it online. We love it. It is the perfect size and style for our outdoor terrace. It is very easy to keep clean - which is important to me. I have been looking for a nice trash can for my Kitchen for months! My husband felt it was too expensive for a trash can ... until it was delivered. He LOVED IT! We loved the way the bags fit the trash can and the easy to remove liner for quick change of bag. 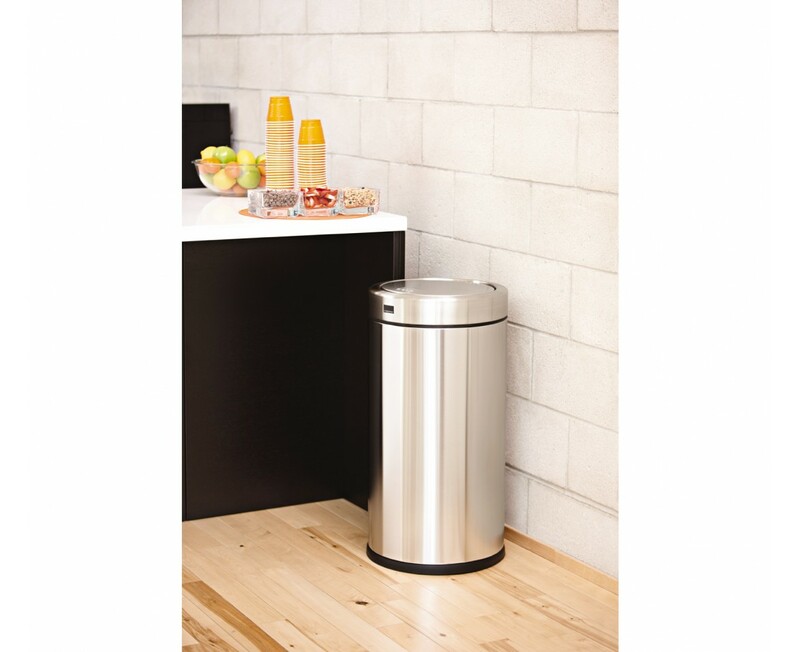 This trash can is not only beautiful it compliments all my stainless steel appliances. Perfect size for my family, perfect look, perfect functionality and excellent quality! Love this trash can. We had been shopping for a trash can and settled on this one. We made the right choice! These are just what we wanted. Saw these cans at another church and wanted them for ours. Who knew a trash can could spruce up a foyer?!?! They look great and are easy to use and empty. Everyone loves them and we are looking forward to having them around for years to come! We did have an issue with one of the lids being dented. The customer service folks were prompt and helpful and we received a replacement lid under warranty very quickly. Great product, great service. Great design! Sleek, practical, and sturdy. Great product overall. Very expensive and nice trash can. I like the shiny metal finish and its large size. I previously had purchased another trash can from Simple Human and I had given it to my mother; a can that cost 200.00 dollars. I like the swivel top that I do not have to press down a lever to open. I like the size and durabilty with witch this prouduct is made. The only thing that would make this can better is if it opened with a sensor. We like this can because it is heavy weight (we have pets who could knock a lighter can over) and has no breakable parts on the lid. The swinging lid is also balanced well. 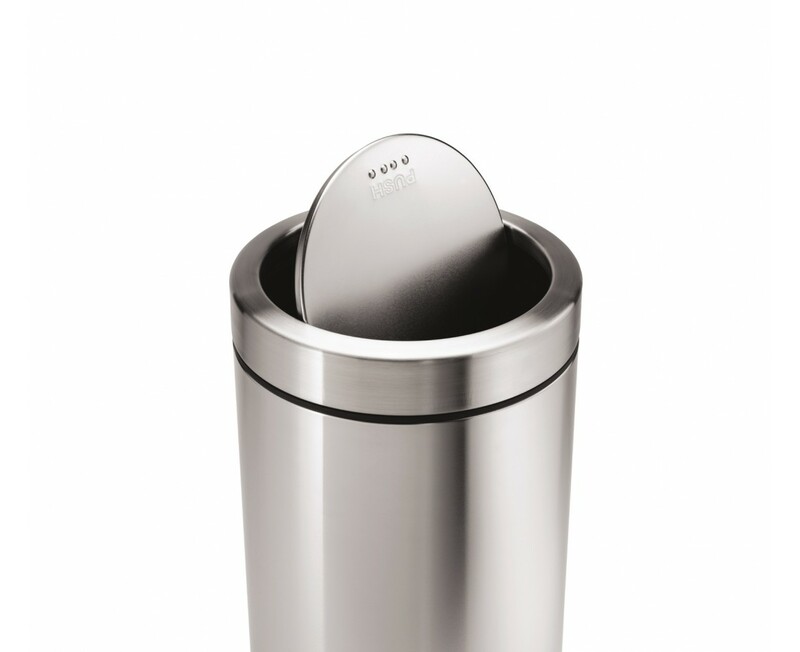 The top can be easily lifted off when you need to empty food from plates or large items. Even though it can't be filled to the very top because of the swinging lid, it has a very large capacity. You do need to use the simple human bags in the recommended size. We are very pleased with our purchase. I have it in a busy hallway of my medical office. It is in use constantly, size is perfect, swinging top is the best feature. It looks terrific! The trash can works great and I like the styling but I believe it could be improved using a more durable and stain resistant steel would be beneficial. Otherwise it's a Great Can!!! We love this trash can! We love the size of the trash can and the swinging lid is exactly what we were looking for -- we were a little apprehensive about spending so much money when we bought this trash can, but after using it for a while it has definitely been worth every penny and we would do it all over again. We will never own anything but a Simple Human trash can from here on out. I have owned many cheap swinging-top and pedal trash cans, but they've always been disappointing. They didn't work, or were high-maintenance, or they required special trash bags that cost more. Then, after encountering one of these in the bathroom of a local cafe, I was delighted by its simplicity and quality construction. I bought one and I was amazed that it was not awkward. I eventually bought two of them. No special bags are required, as the weight of the cover holds the edges of the bag in place. The design of this swinging top means there's no complex levering system to break. I wish all products were thought out and implemented with as much care and brilliance as this was.